Mr. QLI is in town and has a free evening, and thankfully this time I didn't have plans. As I'm trying to restart my diet regime in the new year, I decided that I didn't want to have a big dinner. Trying to get a table for Friday night on short notice is always a challenge, so I figured we should just grab ourselves a bite at Caprice Bar. 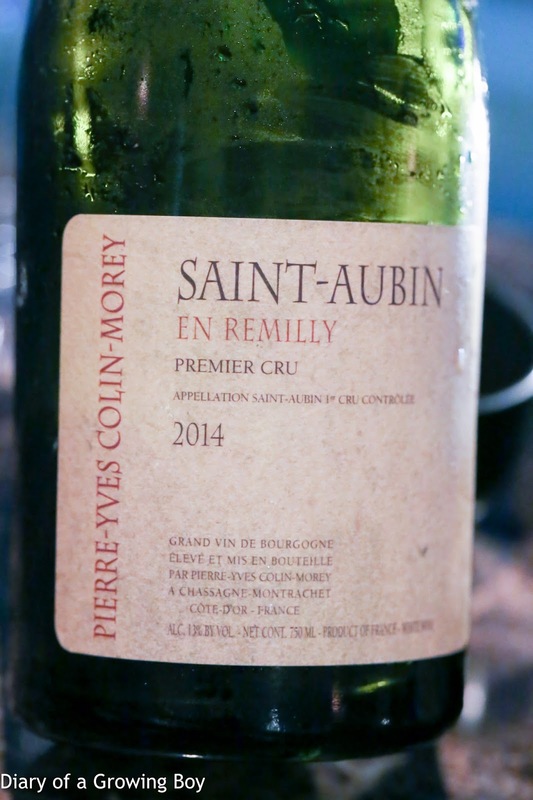 2014 Pierre-Yves Colin-Morey Saint-Aubin 1er Cru En Remilly - lovely wine, with a big and explosive, toasty nose. 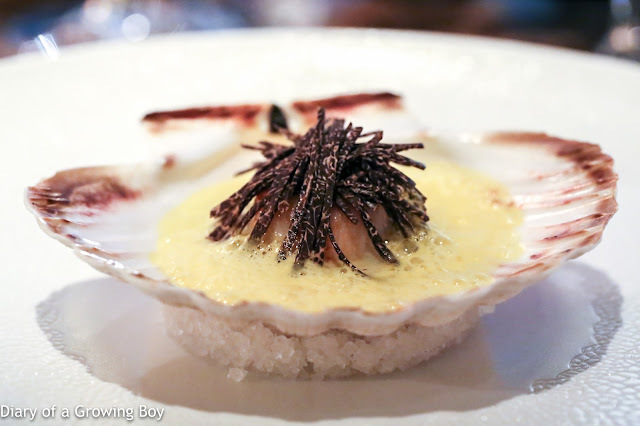 Brittany scallop in pumpkin soup, mashed potatoes, and truffle - now THIS looked nice an appetizing way to start the evening! Of course the scallop was perfectly mi-cuit. The whole dish was warm, rich, and comforting - perfect for a chilly winter evening. Not that 18°C would be considered chilly, of course... 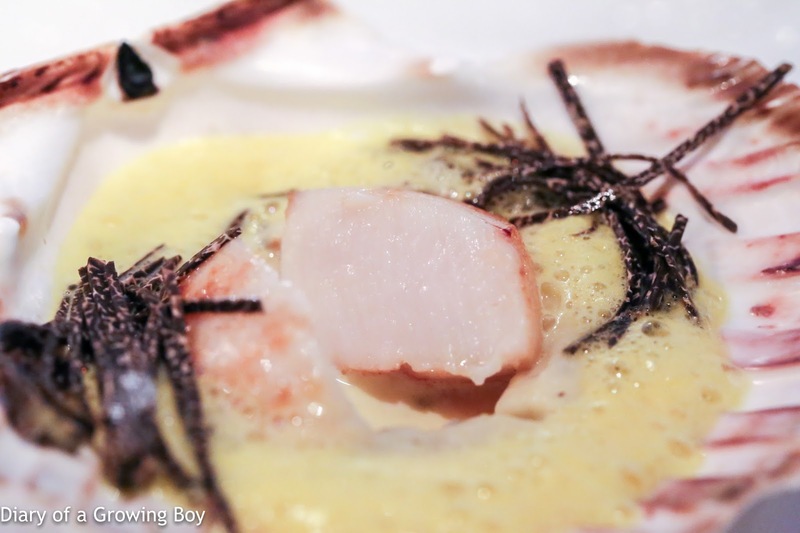 The fragrance of the black truffles was incredibly alluring. 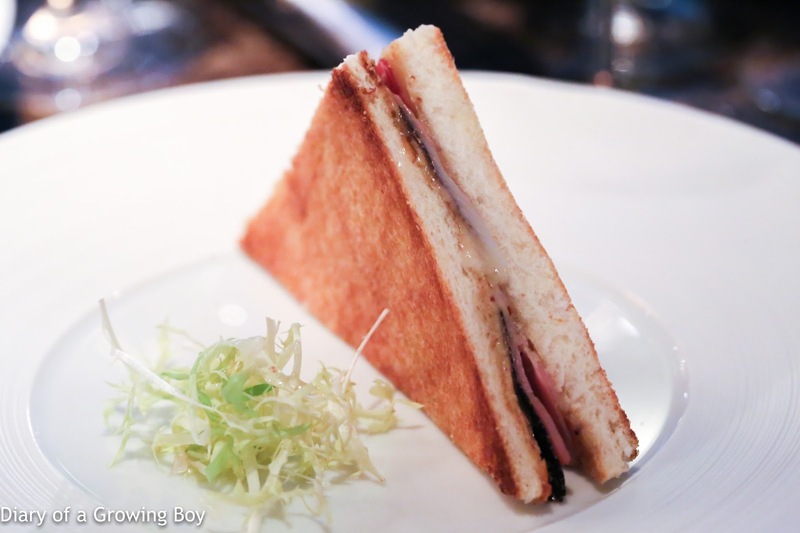 Croque-monsieur à la truffle noire - well whaddayaknow... we got our croque-monsieurs, anyway! And what an incredible one this was! 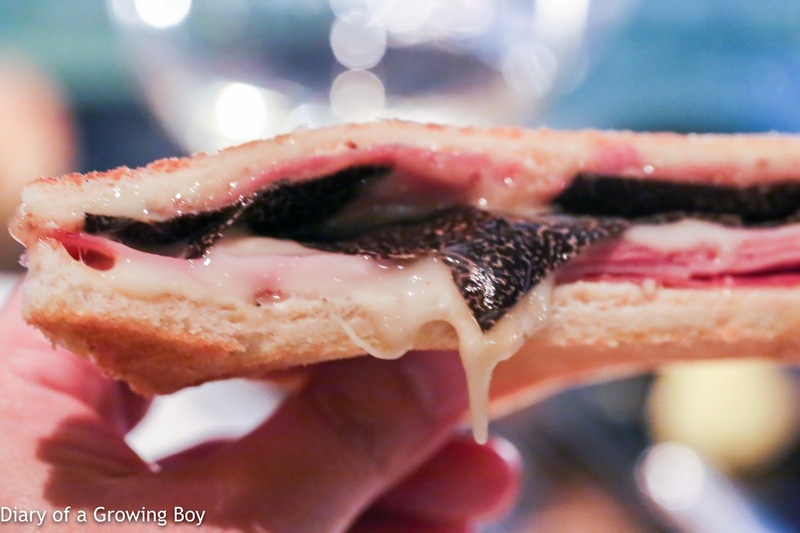 Pata negra ham, melting, dripping cheese, and freshly shaved slices of black truffle. What an incredibly sinful and delicious sandwich! I had checked to make sure that I could bring my own wine to the bar, and was told that I'd have to buy a bottle from the list in exchange. We did end up paying the corkage for the next bottle. 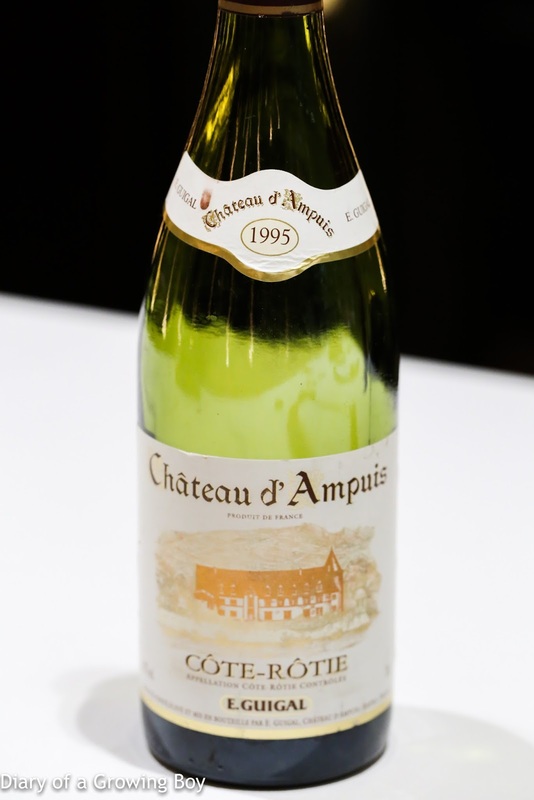 1995 Guigal Château d'Ampuis - decanted for 1½ hours prior to serving. Lovely nose, with minty, eucalyptus, and floral notes. 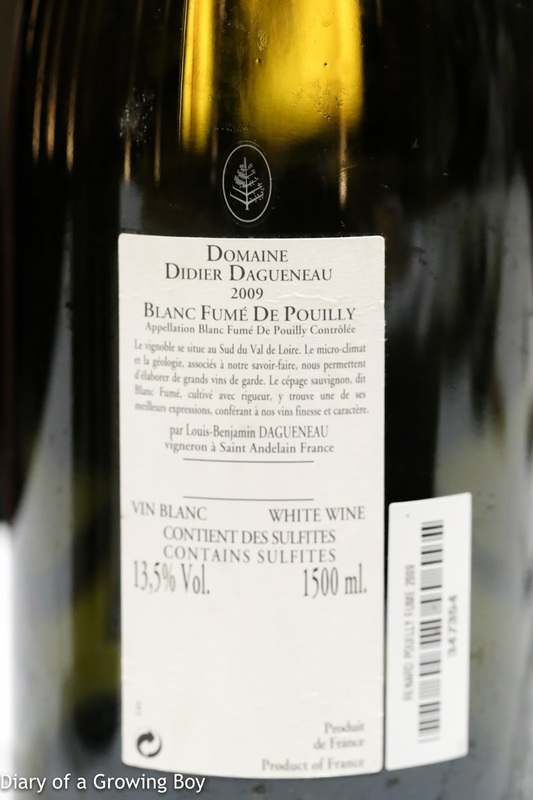 Higher acidity and leaner than expected, with less sweetness on the palate. Didn't have the same power and richness I had expected, so slightly disappointing. 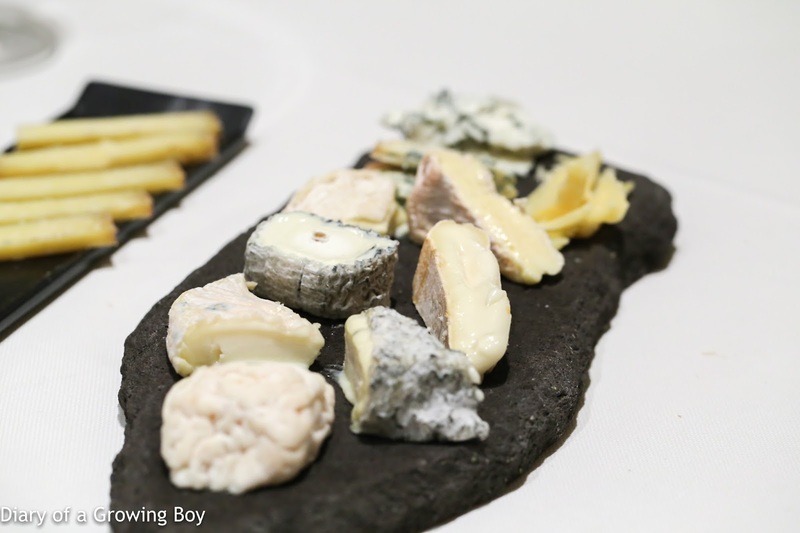 We wanted a little cheese, so we got ourselves a Saint Marcellin from La Mère Richard in Lyon. This was very, very ripe... perfect with my leftover baguette. Speaking of baguette... The first basket of bread we got tonight was undoubtedly the worst I have ever had in all my years at Caprice. Both the sesame roll and the baguette were cold, if a little stale. When the butter in the sesame rolls get cold, it no longer gives one the same satisfaction that is expected of flaky pastry. This was really surprising. 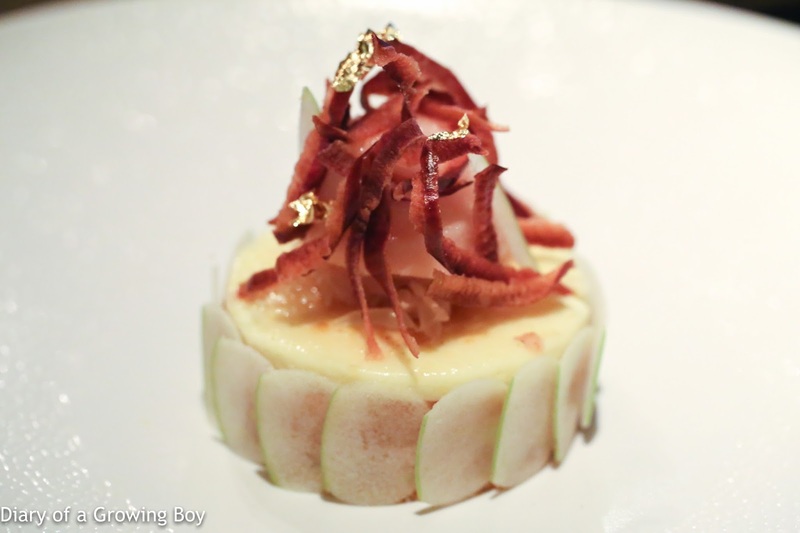 I'm a big fan of pâtissier Nicolas Lambert's, so i wanted to order a few of his desserts from the bar menu. Unfortunately there was a mix-up and I got confused by two different sets of offerings... so I asked to see Nicolas. We ended up asking him to just choose 3 for us. 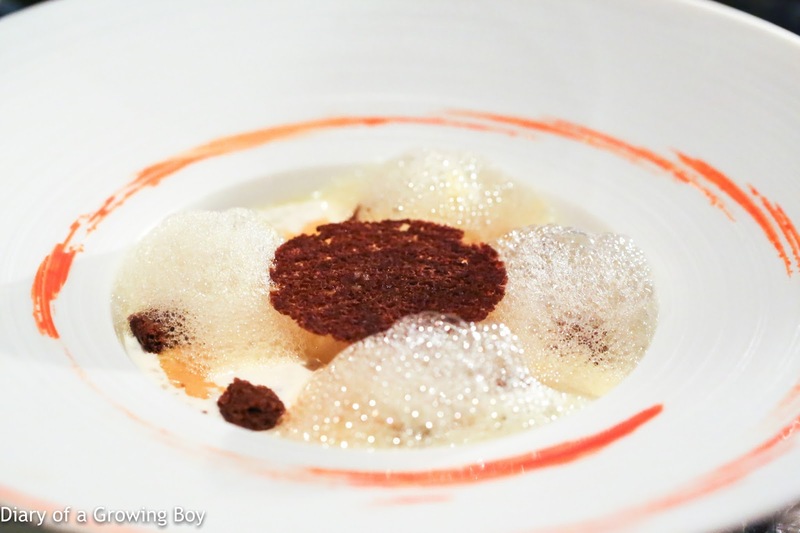 Le pain d'epices et sago façon riz au lait à la vanille de Tahiti, l'orange en sorbet et marmelade - this was a milky sago rice pudding, made a little interesting by the citrus flavors of orange marmalade, sorbet, and foam. Nice, but not much 'wow'. The least interesting of the three. 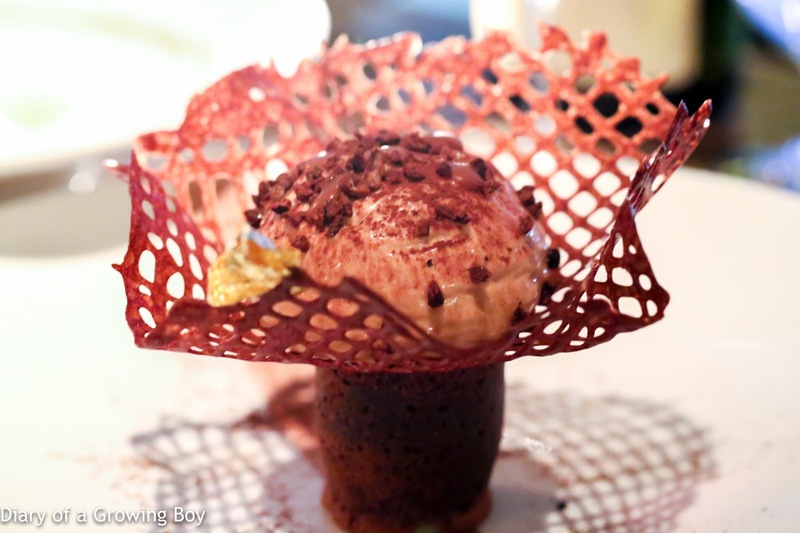 Moelleux au chocolat et caramel - chocolate fondant, with caramelized cocoa nibs, caramel Carambar, carrot chocolate and sea salt tuile, and vanilla ice cream. If you love chocolate and caramel, this is sure to satisfy your cravings. 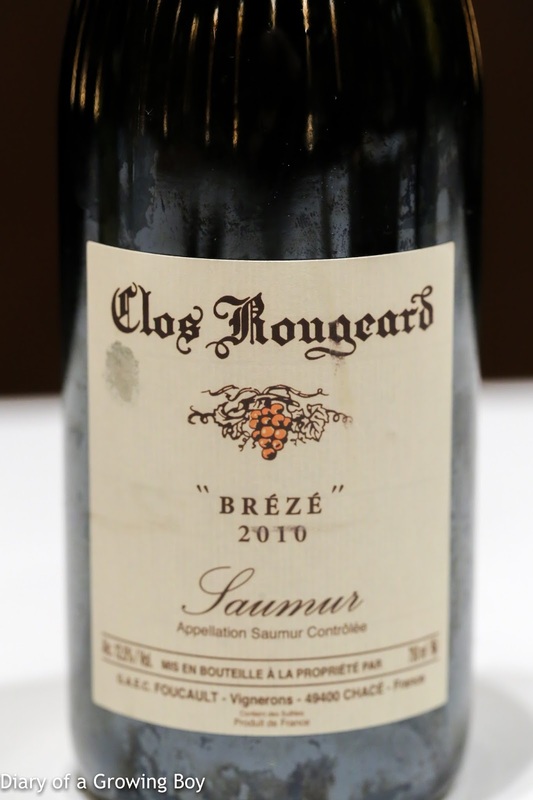 2010 Clos Rougeard Brézé - apparently this bottle was opened 4 days ago. Very fragrant nose, with a little stone fruit, almost a little acetone, and pretty ripe. 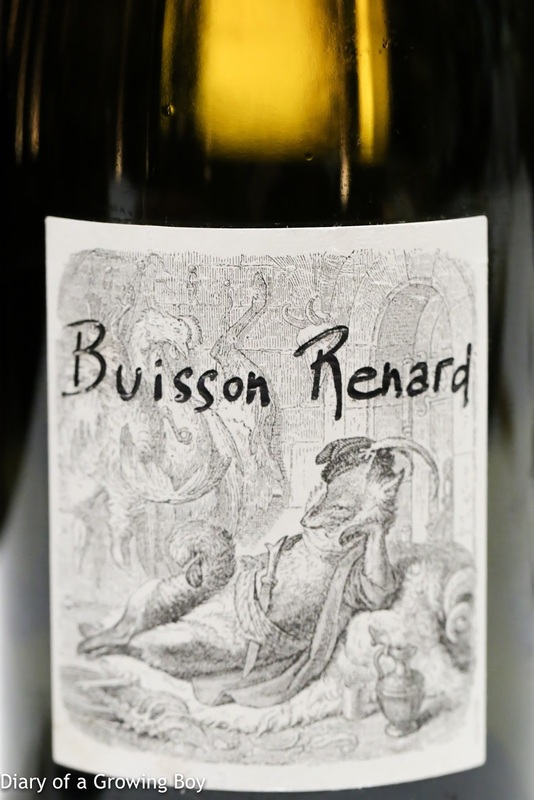 2009 Dagueneau Buisson Renard, en magnum - apparently this was opened 5 days ago. Classic nose of green apple and muscat grapes, and a little pungent. Someone thought it smelled a little like durian, but nah... It's lovely and pure sauvignon blanc. 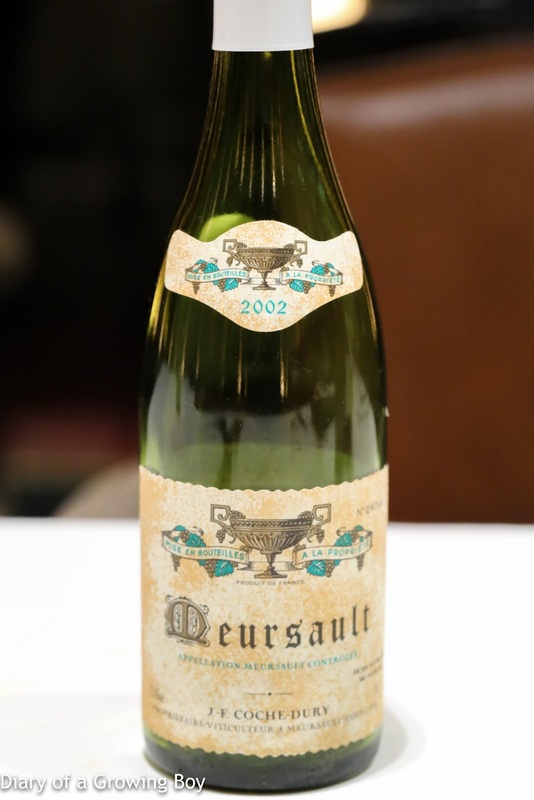 2002 Coche-Dury Meursault - just.beautiful. Classic big, toasty nose. A little buttery. 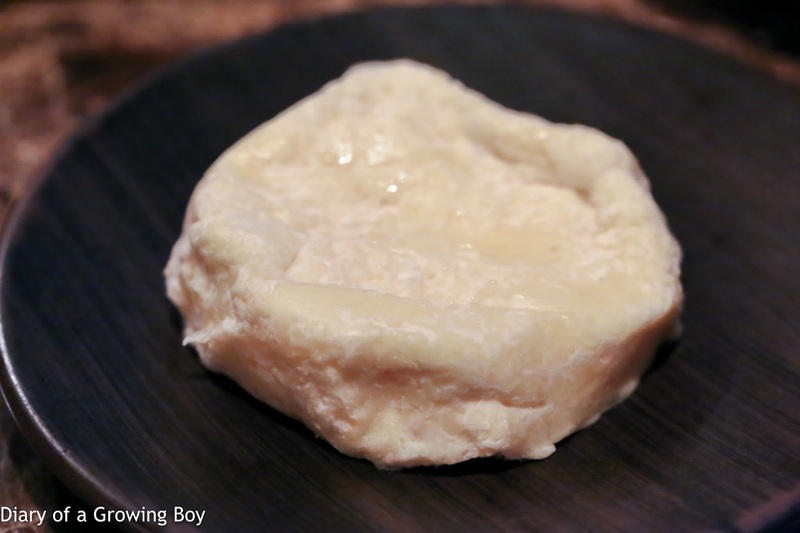 We also nibbled on a little cheese, including 4-year old Comté and 3-year old Gouda. This turned out to be a good evening, and we had plenty of delicious wine. Only problem, though, was that it wasn't as "light" of an evening as I had hoped for... Many thanks to Hairy Legs and Nicolas for sending us the goodies.